If you believe that the consumer is struggling right now, then these charts will help verify your beliefs. However, you should also note two quality investment opportunities despite these trends. When investing in retail, look at comps performance. Comps measures sales at stores open at least one year, and it's a great indicator of demand for a retailer's products as well as customer loyalty. How do you think Wal-Mart Stores (NYSE:WMT), Target (NYSE:TGT), and Staples (NASDAQ:SPLS)are performing in this key metric? The theory many investors and analysts have is that we're in a similar time prior to the 2008 financial meltdown, and if that's not the case, then the consumer hasn't fully recovered. But even if you exclude this potential factor, Target's data breach and Canadian operations have hurt, not helped. The data breach impact will pass, but if Target continues to invest in Canada and it doesn't pan out, then it's going to hurt the bottom line, which is what we don't want to see as investors. You might notice the comments in the chart, and those comments make sense, but...Wal-Mart has a significant future growth driver with its small-box stores. While the pilot programs for Walmart Express have gone well, Neighborhood Market has already delivered in a big way. It has delivered comps gains for 46 consecutive quarters, and comps increased 5% in the first quarter year over year. Better yet, Neighborhood Market has seen strength in all segments, including produce, meat, adult beverages, and pharmacy. Keep in mind that if the stock market were to tank, it wouldn't impact Wal-Mart customers. They're already at the bottom. Therefore, if Wal-Mart can deliver positive results despite a hesitant consumer, then it's highly likely that Wal-Mart will continue to invest in this segment, which would lead to market share gains. This is in addition to Wal-Mart being ranked No. 4 by Internet Retailer in terms of sales (for online sales). It only trails Amazon.com (NASDAQ:AMZN), Apple, and Staples (Apple just stole the No. 2 spot from Staples). Not only has Staples lost its No. 2 online sales ranking, but its business unit income declined to 3.5% of net sales in the first quarter versus 6.2% of net sales in the year-ago quarter. Staples is shifting from office supply needs -- due to the trend toward the paperless office -- to essentials. These essentials range from goggles to mops to coffee to dog biscuits. This might work, but it's going to lead to a lack of differentiation. And by offering everything -- it's currently adding thousands of products online per day -- it pits itself up against Amazon. Staples' 2014 restructuring plan is expected to lead to $500 million in savings by the end of fiscal-year 2015. Staples will close 250 underperforming North American stores, and it will cut costs in its supply chain, labor force, and IT hardware. Any company can cut costs to improve its bottom line, but doing so while also growing its top line is difficult. Those are the types of investments we want to find, but Staples doesn't fall into that category. Staples' North American commercial sales increased 0.7% year over year, but the overall picture is still very challenging, especially when it's now up against Amazon online and Wal-Mart (and Target) in the brick-and-mortar space. And, yes, Wal-Mart and Target are also growing e-commerce threats. 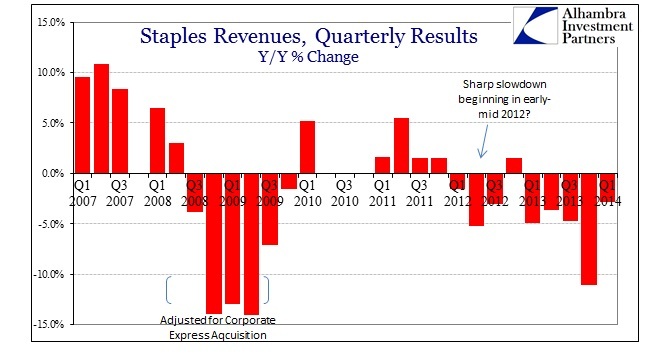 Furthermore, consider that Staples has seen its revenue decline 6.2% over the past five years (trailing-12 months) while selling, general, and administrative expenses have only declined 2.2%. This indicates a lack of efficiency. Amazon, on the other hand, has grown its top line 260.2%, while selling, general, and administrative expenses have grown 252.1% over the same time frame. This is a sign of quality efficiency. Wal-Mart has also been impressive in this regard over the same time frame, with its top line outpacing its selling, general, and administrative expenses: 18.7% versus 17.1%. Amazon is the No. 1 online retailer in the world measured by sales , and there's no reason for this to change in the near future. Given the consistent growth in online shopping, Amazon should continue to grow. Wal-Mart's comps might not be impressive, but if you focus on one of its biggest future growth channels -- small-box stores -- the future looks bright. Target is facing too many headwinds for immediate consideration. However, it should eventually recover. Staples would require a bigger turnaround and should be avoided unless you're a big risk taker.